My goodness what a busy week that was! I can’t believe it’s Friday again already! Brief Synopsis: Billy Waddler is making a film. A film about a moose. At least, it’s supposed to be about a moose. But this moose simply will not conform to Billy’s idea of what a moose should be. In fact, no one in this book is behaving the way they’re supposed to. What’s a filmmaker to do? 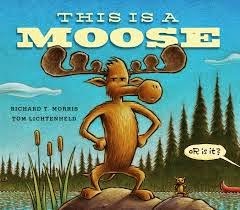 Links To Resources: Fun facts about moose; Classroom activities about moose, including a hands-and-feet moose poster and a make-your-own moose with moving parts; Moose coloring pages; Moose maze (there are other animal mazes, too); read and compare with Morris The Moose Goes To School by Bernard Wiseman; ask your kids or students what they want to be when they grow up. PPBF bloggers, please leave your post-specific links in the list below so we can all come visit you and see what delights you chose this week! Congratulations! I know who to tap when I need to prepare my own school visits. . . . . Hmmmm. I wonder who is on the 2015 schedule at our school. Thanks for the book review. Girls like to giggle, but boys love it when chaos ensues. I've got to find this for my little non-conformist. Well, this book just looks hilarious! And I like hilarious. I'll have to check this one out! Thanks! That sounds fun and cute, Susanna. Just like your school visit. Enjoy the long weekend! Ooh I love the bulletin boards with your name! You are a rock star author. 🙂 I've seen Moose reviewed twice now and there's no excuse for me not to get myself a copy to read. It looks hilarious. Aww! Look at all the little groundhoggies! What a wonderful welcome. And I love the idea of nonconformist moose. Or is it mooses? Meese? This picture book pic sounds perfect for me – so silly and ornery (my middle names)! Putting it on my to-read list. Happy Friday! I love the board too. This book looks familiar, but I realized the one I recently checked out was a 2010 book by a different author. 🙂 We'll have to find this one. I'm not sure why I couldn't comment earlier today. Looks like the world is OK now. A world without comments … oh my. Have a great weekend. I'm sure you just WOW the kiddos when you visit. That's a wonderful bulletin board that they created for you. Thanks for sharing such a cute book. Love those non-conformists! Why fit in when you can stand out? Here it is after one and I forgot it was Friday! And I'm #13 on the linky list. Hope that doesn't mean bad luck for me! Lucky you to receive such a warm welcome, Susanna. And lucky kids to meet you. I look forward to reading your pick – I love the expression on the cover. Great review! Will have to get this one for our school library. I have been waiting to see this one and I am sure I won't be disappointed. Or will I? 🙂 Great review and enjoy your weekend. 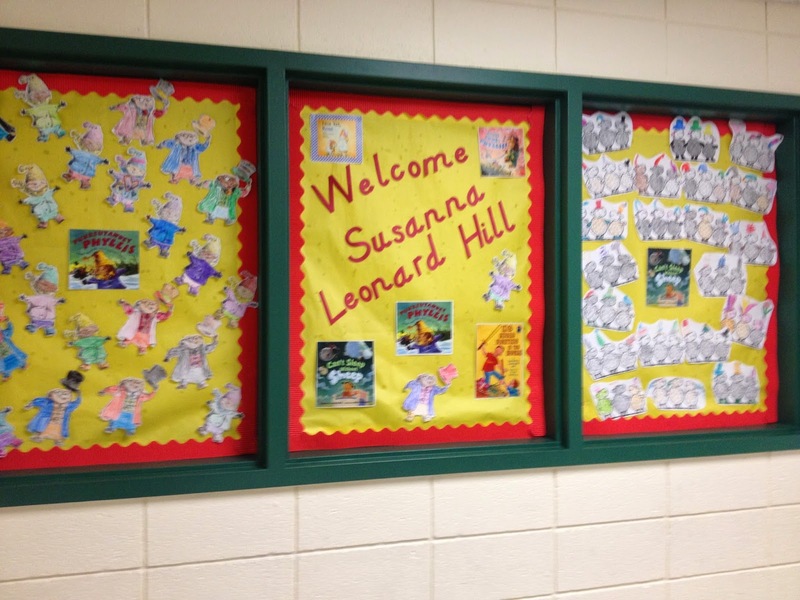 I love the bulletin boards! You're my idol! Nice bulletin board to greet you! That moose book does sound very funny! I'll have to keep an eye out for it. And I love your choice for PPBF. Be who you want to be moose! Yeah! Hahaha 🙂 I don't think you'll be disappointed 🙂 Have a great weekend! It really was lovely! I was so touched. As you can tell by the fact that I took pictures 🙂 I hope you like This Is A Moose if you get to read it – I think Jeremy would enjoy it too. And no worries about PPBF… although I think I may have seen a post notification from you in my overflowing inbox so I'm guessing you managed! I was lucky indeed. It was a great visit! I think you'll like this one, Julie – I think you'll appreciate the humor and the art! And I believe the word you're looking for is mice. Sadly no. There was no chocolate involved. At all. But amazingly I had a great time anyway 🙂 Hope you enjoy the book! I just read this book and it is absolutely hilarious! Love it! ACK! I am not glad! It bothers me tremendously to know so many people are not getting notifications! But I just realized that I have not been getting notifications from a bunch of blogs – which I realized today when a bunch showed up and I thought, gee, where have they been? I'm hoping that might mean it was a blogger thing and they've now corrected it… but nothing with blogger is ever that simple! I Know WordPress has a Reader and many of the blogs I follow on wordPresss show up there. It has greatly decreased my inbox amount but bloggers didn't do that. I was still getting notifications from blogger except lately. IS there a place you can find out? Discus or someplace? Joining in your discussion with Clare. Your blogposts dropped off my inbox for a while. I only just found it started going to my spam mail! But I'm now getting it again. Sounds like a fun book! I love the idea of a moose astronaut! Congratulations on your school visit! I haven't done one of those yet…I did a school carnival, which was a little less stressful than getting up in front of a roomful of kids and talking. I'm getting hives just thinking about it!